We haven't done one of these for awhile. So I thought I would start a new thread on pics from your early days shooting. 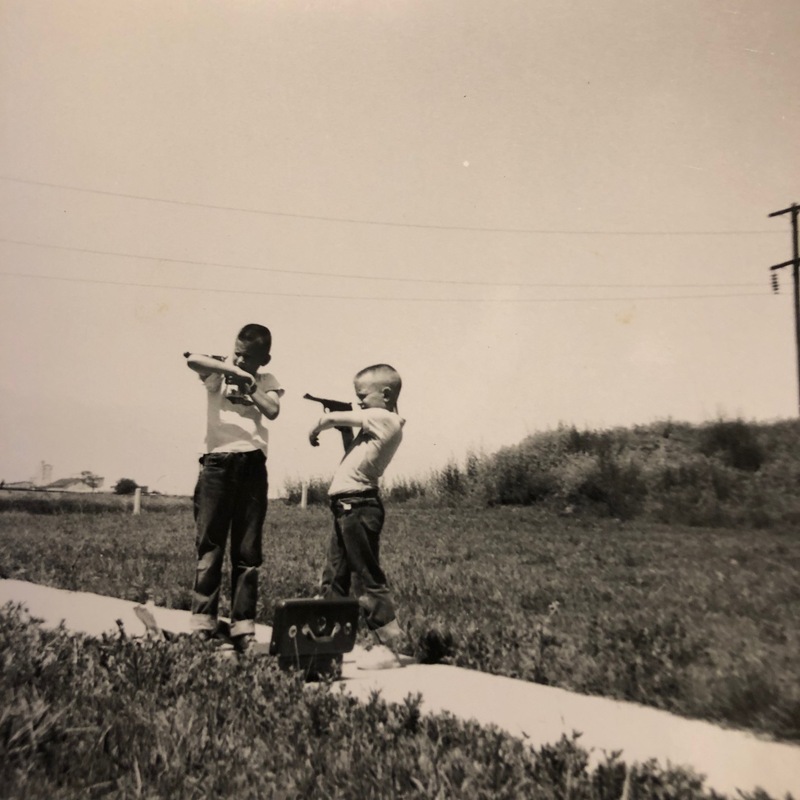 In this case I am the little guy shooting a Colt Woodsman with my brother. This was taken in 1961 out by Valley Center Kansas. Look at that amazing tactical form!!!! 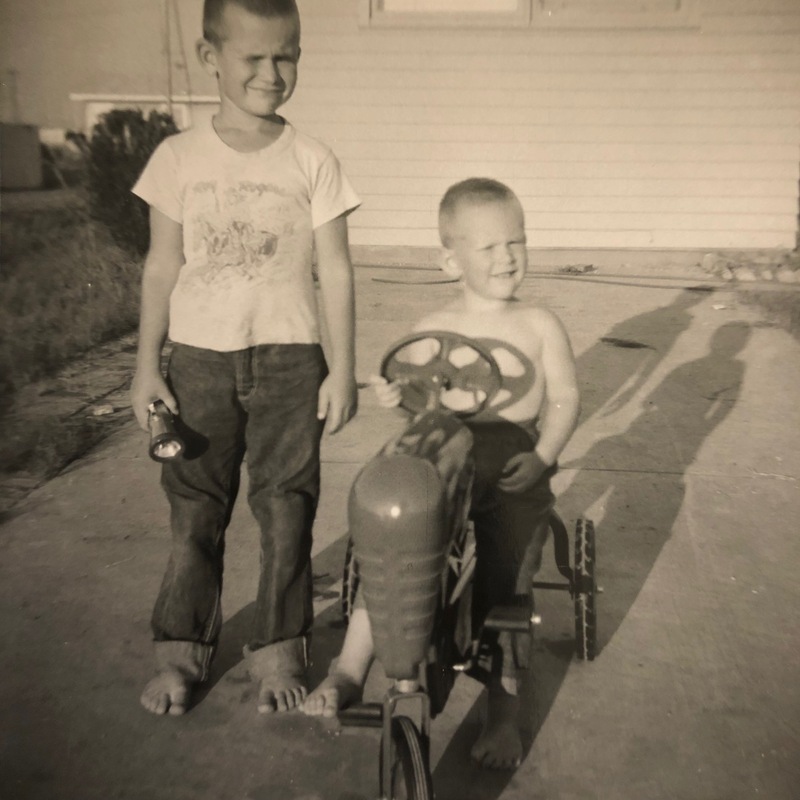 Here is another pic of me and my brother back in 1959 riding the coolest boy toy ever. h20joe, JimmyA, dennisturner and 8 others like this. It kinda looks like you just shot your friend lol. I wish I had some old pics of me shooting. Nice memories though, well done! From where I'm sitting, I could hit Valley Center with a little pea shooter! That's a nice photo. Good memories. have had to have been carved on a stone tablet. I had a .22 rifle when I was 8 and we lived at the edge of town. Directly across the road was nothing but fields and forest for miles. 4 of us spent entire days there plinking and having fun. Never shot anyone by accident either...........imagine that. silverstring, 777Driver and tobywan45 like this. I don't think you can find an edge of town anymore. silverstring and Czechbikr like this. Valley Center is a bit more than a few farm houses and fields now. But interesting to know that silverstring was a part back in the day. I grew up and did the first shooting that I recall just outside of Park City to the South just a town over from Valley. I don't know of any pictures of us shooting though. Park City.... home of the BTK Strangler, https://en.wikipedia.org/wiki/Dennis_Rader. I lived within 2 miles of that guy, and pretty sure he would have at times driven right by our house heading into Wichita to do his dirty deeds. Funny, I just now realized looking at that wiki page that I now drive by his "new" home (for over 9 more life sentences) at least once every week or two! silverstring, daytonaredeye and DeltaBravoKS like this. Thanks to all the Trump voters, we may have just started the country's reversal! One of life’s little rewards! I flew into Wichita for a business meeting during the BTK reign of terror. I wondered if I would run into him. Course, I might have but never knew it. DeltaBravoKS and silverstring like this. I really don’t know how rolled up jeans ever went out of style. I could wear a pair for a couple of years - just unrolling it bit by bit - back when I was growing up. Course, when I hit age 13 my growth spurt started and I went from 4’5” to 6’ in 3 years. Had to buy new clothes every 6 months. silverstring and Ironmagz like this. Ha ha.... never thought about the rolled up pant legs being an answer to buying so many pairs through the growing stages of youth! I shot my gun!!! Hit it first shot! True story!! Wanna see a pic of my PT809c in it's new Old Faithful holster?